The recent horrific events in Japan were a brutal reminder of just how fragile the human race is. Mother Nature has always been a force to be dealt with; now with our burgeoning population and the rapid urbanization of the planet, her power over our wellbeing is undeniable. The tragedy in Japan is the most recent on record; however, it follows a decade of destruction. In 2001, the United States experienced a cataclysmic man-made disaster on September 11; in 2004, Asia suffered a debilitating tsunami; in 2005, the Gulf Coast was ravaged by Hurricane Katrina; and in 2010, Haiti was pummeled by a catastrophic earthquake. 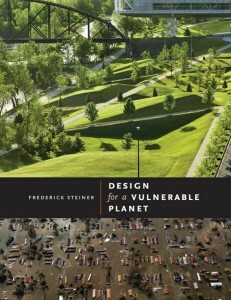 Our planet is fragile, and in his just-released book, “Design for a Vulnerable Planet,” Dean Fritz Steiner of the School of Architecture at The University of Texas at Austin tells us why. Urbanization and population growth contribute to our frailty; however, so do unlimited resources and a vast overuse and misuse of natural resources critical to our survival, such as air, water, land, gas and oil. According to Steiner, part of the solution toward healing our planet is that architects and planners thoroughly understand the landscapes in the regions in which they work. “We must understand the full costs — economic, social, cultural, ecological, and environmental — to design and build a better planet,” Steiner says. We must acknowledge the relationship between our health and the built environment. We need to build green. We must stop sprawling and do a better job restoring and conserving our current built environment. We need to think, and build, regionally. The last one is a theme woven throughout the book. Designs and plans that are suited to their place are more sustainable than conventional approaches. By understanding climate and water flows within a region, architects and planners can design more appropriate, more sustainable, buildings, parks and communities. With the birth of modern design, the age-old concept of regionalism was slowly abandoned. Refrigeration, air conditioning, central heating, television, radios, computers, automobiles and cell phones — those things that connect us — also disconnect us from one another and from nature. Physical and emotional health are connected, and there is nothing more physical than the environment in which we live and work. Steiner believes that suburban sprawl is an unnecessary evil and that, as American cities continue to sprawl, Americans grow fatter. In 2009, the American Academy for Pediatrics reported that 32 percent of U.S. children are overweight. Their report linked the growing number of overweight children to the physical inactivity and to the lack of safe neighborhood design that supports walking to schools, parks and recreational facilities. More people live in cities now than ever in our global history and continued urbanization is inevitable. What this means is that natural and man-made catastrophes have and will affect millions more than they would have decades ago. We must learn to adapt our cities and buildings to build a healthier today, tomorrow and future. It is something designers and planners can, and should, be doing now.